The findings at Tilaurakot are at least 2,800 years old. 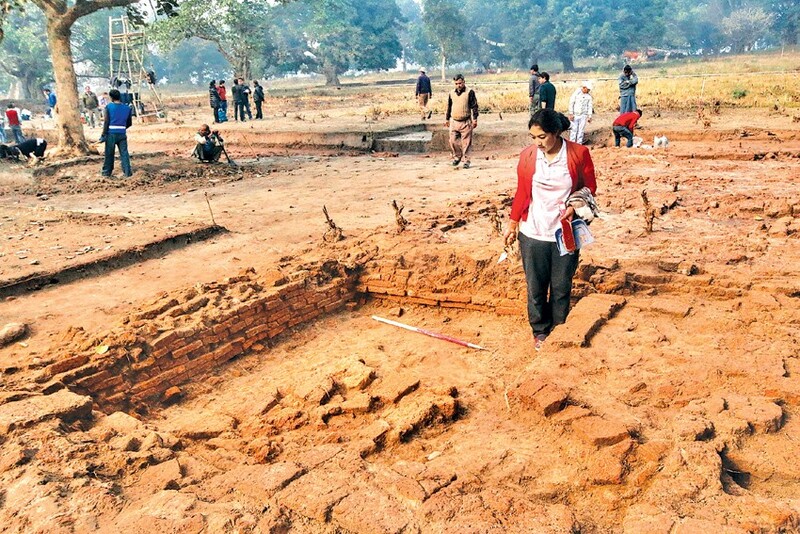 Mar 11, 2016- A team of archaeologists, including some foreign experts involved in excavation works at ancient Shakya Capital city of Tilaurakot, have claimed proofs to support the existence of historical stupas, monasteries and palaces in Kapilvastu district. fifth and seventh century respectively. Kosh Prasad Acharya, a senior archaeologist, said they have found the remnants of houses, roads, walls and wells after three years of digging. “These findings match what the two Chinese travellers had mentioned in their travel accounts. We are still exploring the site,” he said. Robin Coningham, the chief archaeologist, said the ancient infrastructure could be at least 2,800 years old. The excavation began after a geophysical survey showed structure and an entry gate. Archaeologists suspect the structure could have been an administrative building of the time. A one-and-a-half-metre wide wall was also found 25-30cm below the ground during the excavation. Chief of the Department of Archaeology (DoA) Ram Bahadur Kunwar said they a large ancient infrastructure in the central part of Tilaurakot was found this year. “We have found the several remains of the ancient city underneath,” he said. The archaeologist’s team comprised mainly of 10 professors from Stirling University and Durham University of the United Kingdom, two Unesco consultants, five experts from the DoA and four from the Lumbini Development Trust. Thirteen students studying culture and archaeology at Tribhuvan University also have been involved in the excavation. Stupas 200 years before buda? Who knows? :) Tradition holds that there were Buddhas before Gautama. Besides this, these new discoveries can help in deciding the long dispute about Piprahwa and Tilaurakot about which is the real Kapilavastu!